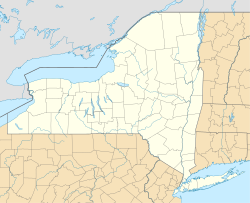 Ta Middletown ny ard-valley ayns Orange County, York Noa, ny Steatyn Unnaneysit. T'eh ny hoie ayns ard Ghlion Hudson ayns York Noa, faggys da Awin Wallkill as faggys da bun Sleityn Shawangunk. 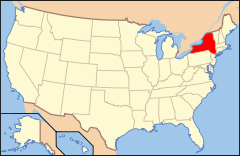 Ta Middletown ny hoie eddyr Port Jervis as Newburgh, York Noa. Va 25,388 cummaltee 'sy valley ec coontey-pobble ny bleeaney 2000. She 10940, as 10941 ayns cooishyn er lheh, y coad zip ayn. Ta Middletown ny phreeu-valley er Ard Staydraaoil Moirvaljagh (ASM) Poughkeepsie-Newburgh-Middletown, as ta'n ard shen goaill stiagh dagh ooilley phaart jeh ny coondaeghyn Dutchess as Orange. Va 621,517 cummaltee 'syn ASM daa-choontae ec coontey-pobble 2000. Rere ooley-pobble 'sy vlein 2007, v'eh er credjal dy vel 669,915 cummal ayn. Myrane lesh shen, ta'n ard-valley ny hoie er joarey twoaie jeh ard moirvaljagh York Noa. Chionnee John Green thalloo veih'n phaiteen DeLancey as s'cosoylagh dy ren eh cummal 'syn ard mygeayrt ny bleeaney 1744. Er oyr y soiaghey echey eddyr buill v'ayn roie, va'n ennym Middletown ("Y Balley Meanagh") doltit, agh ny s'anmey va'n ennym ceaghlit dys South Middletown ("Y Balley Meanagh Jiass") myr va'n ennym cheddin ec boayl elley ry laue. Fy yerrey, va'n fockle "south" treigit, as eh lhiggey da'n ennym noa-emshiragh traa haink er y voodeeys dy ve ny valley beg ayns 1848. Va'n balley beg cochorpit myr ard-valley ayns 1888. 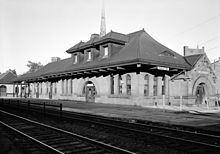 Daase Middletown lesh yn Erie Railroad as y New York, Ontario and Western Railway (mastey colughtyn traenagh elley) as haink ram failleyderyn dys y valley, lheid as thieyn obbree braagey, yiarnyn lommeyderyn faaie, as cooid-hie, agh haink jerrey lesh mooarane jeu ayns ny 1960yn. V'eh ny ghrogh-haghyrt da'n tarmaynys ynnydagh na dooney'n thie obbree mooar jeh chooid y Ford Motor Company ayns Mahwah, New Jersey, as jee-vooadaghey obbreeaghtyn ec IBM. Agh, haink shiartanse dy veoiryn shee, moogheyderyn aile, as obbreeyn elley dys yn ard veih Balley York Noa, as yn arraghey shen goaill toshiaght ayns ny 1970yn, dys thieyn ny s'inshley er leagh dy chionnaghey. She'n Middletown and New Jersey Railway yn un raad yiarn ta faagit 'sy valley. Haink er çheshvean Middletown dy ve boght myr eiyrtys er aase straih as ynnydyn shappal ec çheu hiar jeh'n valley, rish y vayr Route 211, faggys da Route 17 as Interstate 84. Ta shiartanse dy thieyn treigit as goan-ymmydit 'sy çheshvean, agh ta bioys iu breeoil ayn er feie tammylt, as nish ta oastanyn foshley. Ta shiartanse dy chialteenyn shendeeagh 'sy çheshvean, as ta shiartanse dy thieyn Victorianagh ry-akin er Highland Avenue. Ta cooid vooar jeu cummaltit ec fir lhee as nyn lughtyn thie, lesh rheynn ayn ta caglit da oik yn 'er lhee. Ta cooid jeh ny thieyn Victorianagh smoo ymmydit jiu myr thieyn boandyrys. Ta naboonyssyn berçhagh ennagh ayn, lheid as Presidential Heights, agh ta kuse vooar dy naboonyssyn boghtey myrgeddin. Ta Middletown soit ec 41°26′45″N 74°25′19″W﻿ / ﻿41.44583°N 74.42194°W﻿ / 41.44583; -74.42194 (41.445754, -74.422066) ayns Orange County hiar. Ta'n balley begnagh cruinnit liorish Balley Wallkill, çheumooie jeh'n ayrn jiass. Ta'n ayrn shen çhemmit liorish Balley Wawayanda. Rere y United States Census Bureau, ta'n balley 13.3 km² (5.2 mi ker) er eaghtyr. She thalloo ayn 13.3 km² (5.1 mi ker) jeh as ta 0.19% jeant seose d'ushtey. Ta'n Monhagen Brook as y Wallkill River jeeigey'n balley. ↑ Annual Estimates of the Population of Metropolitan and Micropolitan Statistical Areas: April 1, 2000 to July 1, 2007 (CBSA-EST2007-01) (CSV). 2007 Population Estimates. United States Census Bureau, Population Division (27-03-2008). Feddynit er 18-01-2010. Ta tooilley coadanyn mychione Middletown, York Noa ry-gheddyn ayns Wikimedia Commons. (Baarle) (New York) Ontario & Western Railway Historical Society, Inc.
Hie yn duillag shoh er ny reaghey er 9 Mayrnt 2013, ec 03:28.